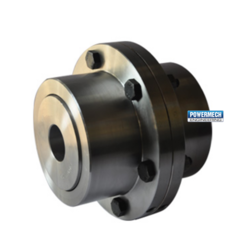 POWERMECH offers Full Geared Couplings, Half Geared Couplings, Brake Drum, Brake Drum Couplings of LOVEJOY, FENNER, Bhartia Cutler-Hammer BCH, ALLFLEX. Powermech Engineering offers complete range of Allflex Gear Couplings, Spindle Couplings and Torsion Shaft type gear couplings. The range includes Gear couplings with torque rating of 50-1000000 kg-m with bore sizes from 10 mm to 900 mm. Besides the standard ranges, the company can offer gear couplings as import substitute, including couplings with overall dimensions as per AGMA standard. The couplings are manufactured from tested quality material suitably hardened and tempered to achieve longer life. These couplings have extensive applications in steel plants, cranes, conveyors, rolling mills, paper factories, rubber industry, sugar industry, thermal power houses, etc. Full gear coupling - A full gear coupling has a toothed hub which is fixed in both driver and driven shaft, and sleeves which has internal teeth meshing with the hub. 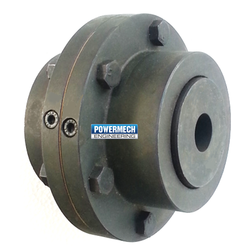 Powermech offers complete range of Gear Couplings, Spindle Couplings and Torsion Shaft type gear couplings. The range includes Gear couplings with torque rating of 50kg-m up to 1000000kg-m with bore sizes from 10 mm to 900 mm. Gear couplings as import substitute, including couplings with overall dimensions as per AGMA standard. The couplings are manufactured from tested quality material suitably hardened and tempered to achieve longer life. Half gear coupling - A half gear coupling has a toothed hub on the driven shaft along with an internal geared sleeve and the driver shaft has a rigid hub. The rigid hub is bolted to the sleeve of the driven shaft. 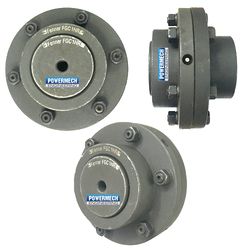 Fenner Curved Tooth Flexible Gear Couplings are made for extensive use in Metal Rolling Mills, Paper Machinery, Cranes, Dredgers, Rubber and Plastic Industries, Cement Plants, Conveyors and Elevators, Compressors, Fans and Blowers, Screens and other general industries. 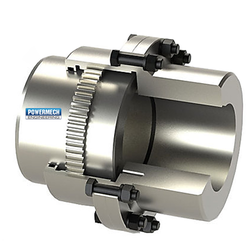 Fenner Gear Couplings are distinguished by their mechanical flexibility and compensation of Angular, Parallel and Axial misalignments of the connected shafts. Flexible Gear Couplings basically consist of two hubs, with crowned external teeth and two outer sleeves with internal spur teeth. Gear Hubs and the outer sleeves are manufactured from carbon steel and are hardened to the required degree. They are machined to fine tolerances for proper meshing of the gears as well as for inter-changeability. The Coupling sleeves are joined together with high tensile steel bolts (Class 8.8 IS: 1367) fitted using a gasket in between them. LUBRICATION: The coupling must be filled with grease or oil. Recommendation for grease (Indian Oil - Servogem EP 1 or equivalent) where maximum temperature is within 80°C. For above 80°C, Oil (Recommended: Indian Oil - Servomesh SP 680 or equivalent).